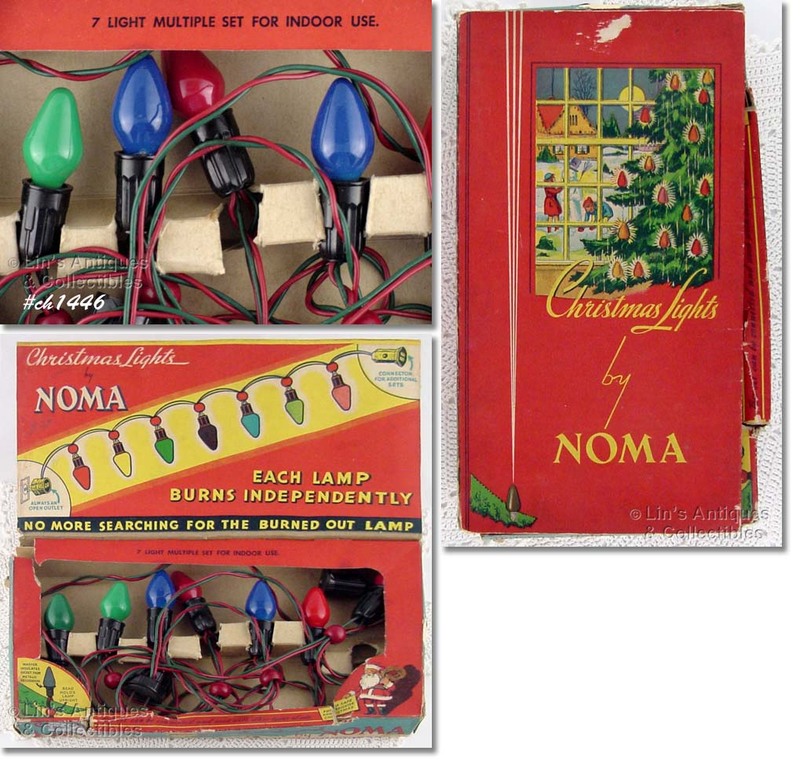 PURCHASED AT A SALE IN INDIANA, THIS LISTING HAS A STRING OF ITALIAN CHRISTMAS LIGHTS IN THE ORIGINAL BOX! THERE ARE 12 LIGHTS AND ALL WORK. SUPER COLLECTIBLE AND A DIFFICULT FIND ITEM! I’VE GROUPED THESE 5 BUBBLE LIGHTS TOGETHER. THE ORANGE/YELLOW BASE WITH ORANGE LIQUID AND THE GREEN/RED WITH GREEN LIQUID BULBS WORK FINE. THE GREEN/RED ONE DOESN’T LIGHT UP BUT IT MAKES CONNECTION WHEN I TESTED IT IN A STRING OF LIGHTS. THE OTHER TWO DIDN’T LIGHT UP. THE SAUCER LIGHTS HAVE GLASS SLUGS, THE OTHER HAS CHEMICAL. NEAT! 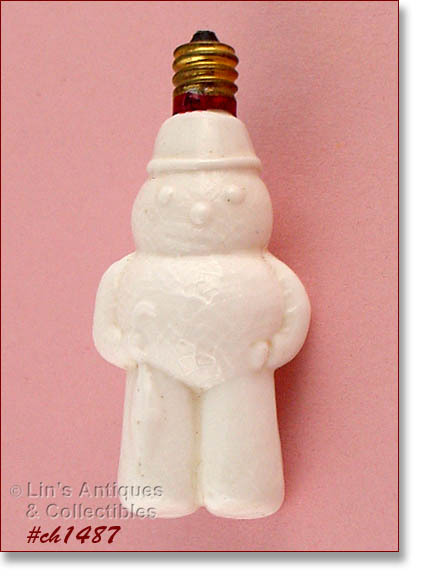 REALLY CUTE FIGURAL BULB – A SNOWMAN! REFERENCE BOOKS REFER TO THIS AS “SNOWMAN WITH A STICK” BUT IT LOOKS LIKE AN UMBRELLA TO ME. 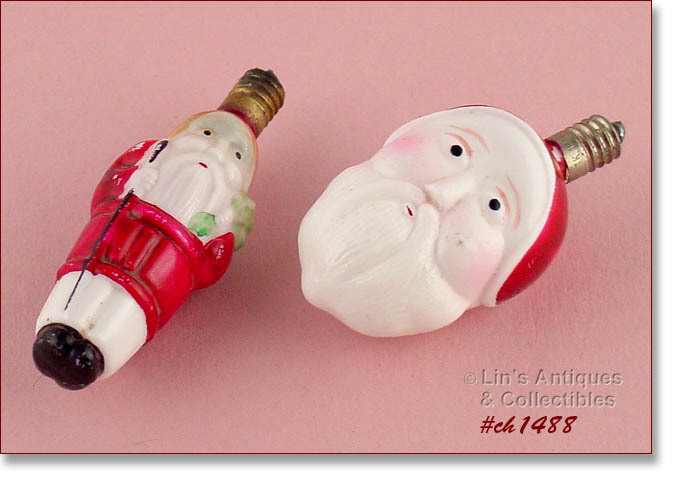 BULB MEASURES 3 ¼” LONG (AT LONGEST) AND IS IN SUPER WORKING CONDITION. THIS LISTING HAS 5 PARAMOUNT STARLIGHTS! THERE ARE 4 RED ONES, 1 YELLOW ONE, AND THEY ALL WORK. NEAT ITEMS, DIFFICULT TO FIND! THERE IS ANOTHER RED ONE THAT DOESN’T WORK – I WILL INCLUDE IT AT NO CHARGE IF YOU WOULD LIKE TO HAVE IT, JUST LET ME KNOW. 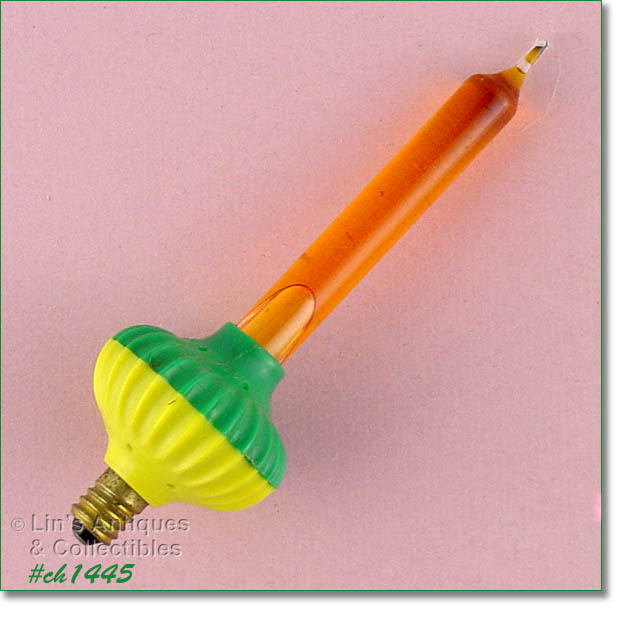 THIS LISTING HAS 4 OIL FILLED BUBBLE LIGHTS AND THEY ALL WORK! DIFFICULT TO FIND! WOW – THESE BUBBLE LIGHTS LOOK ROUGH! EVEN THOUGH THEY HAVE VENT HOLES AT TOP, THEY APPEAR TO HAVE OVER HEATED (THE BULB GETS VERY HOT!!). UNBELIEVABLY, THEY ALL LIGHT UP AND WITH THE EXCEPTION OF THE YELLOW AND BLUE COLOR ONE, THEY ALL BUBBLE. ALTHOUGH THEY LOOK ROUGH, THEY WORK BUT SO BURN HOT. YOU MAY WISH TO USE THEM AS “PARTS” FOR OTHER LIGHTS YOU MAY HAVE. THIS LISTING HAS TWO OLDER BOXES / PACKAGES OF C-6 SIZE BULBS IN THE PRETTY BLUE COLOR. EACH BOX HAS 10 BULBS. A FEW HAVE COLOR RUBS BUT MOST APPEAR NEW, NEVER REMOVED FROM BOX. 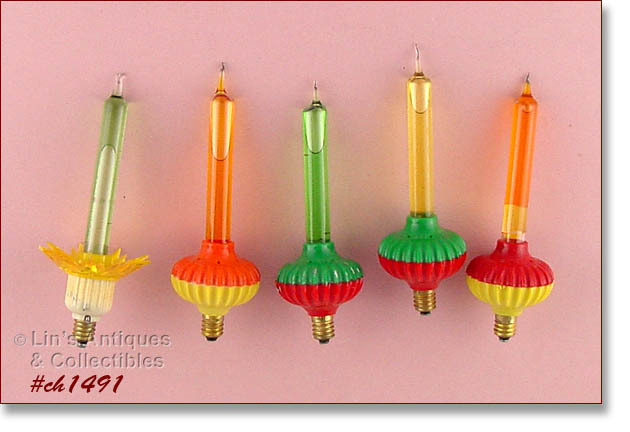 THIS LISTING HAS THE OLDER PACKAGES OF C-6 BULBS IN THE PRETTY YELLOW COLOR. THE SMALL PACKAGE HAS 5 BULBS AND THE LARGER BOX HAS 10 BULBS. A FEW HAVE COLOR RUBS BUT MOST APPEAR NEW, NEVER REMOVED FROM BOX. THIS LISTING HAS A BOX OF 10 RED C-6 SIZE BULBS IN THE ORIGINAL BOX. A FEW HAVE COLOR RUBS BUT MOST APPEAR NEW. THIS LISTING HAS A TOTAL OF 3 PACKAGES OF YELLOW COLOR C-6 SIZE BULBS AND THEY ARE PRICED PER PACKAGE. THEY APPEAR NEW, NEVER REMOVED FROM BOX. THIS LISTING HAS A TOTAL OF 2 BOXES OF ORANGE COLOR C-6 BULBS AND THEY ARE PRICED PER PACKAGE. THESE APPEAR NEW, NEVER REMOVED FROM BOX. I REALLY DON’T KNOW HOW TO DESCRIBE THE COLOR OF THESE BULBS – THEY’RE NOT RED, NOT PINK, NOT RUST BUT ARE IN THAT COLOR COMBINATION RANGE. THERE ARE 3 PACKAGES AVAILABLE AND ARE PRICED PER PACKAGE. A FEW HAVE COLOR RUBS BUT MOST APPEAR NEW, NEVER REMOVED FROM BOX. 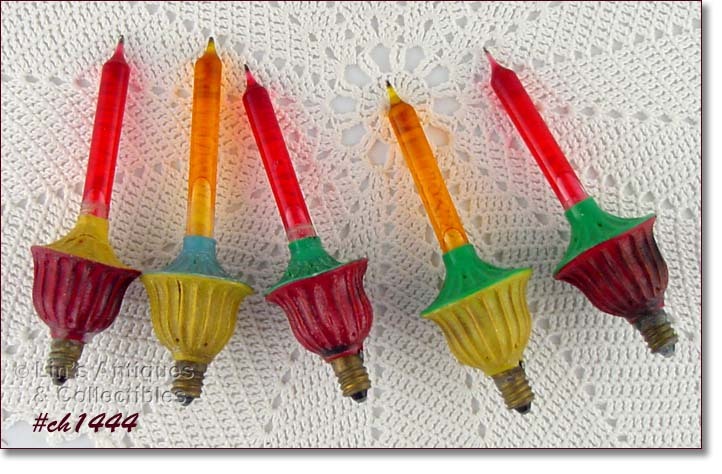 THIS LISTING HAS A TOTAL OF 5 PACKAGES OF RED COLOR C-6 SIZE BULBS AND THEY ARE PRICED PER PACKAGE. THERE ARE SLIGHT COLOR VARIANCES AND A FEW HAVE COLOR RUBS. MOST APPEAR NEW, NEVER REMOVED FROM BOX. THIS LISTING HAS A TOTAL OF 7 PACKAGES OF GREEN COLOR C-6 SIZE BULBS AND THEY ARE PRICED PER PACKAGE. THERE ARE SLIGHT COLOR VARIANCES AND A FEW HAVE COLOR RUBS. MOST APPEAR NEW, NEVER REMOVED FROM BOX. THE WESTINGHOUSE PACKAGE AND 2 NOMA PACKAGES HAVE BEEN SOLD. THIS LISTING HAS A TOTAL OF 8 PACKAGES OF BLUE COLOR C-6 SIZE BULBS AND THEY ARE PRICED PER PACKAGE. A FEW HAVE COLOR RUBS BUT MOST APPEAR NEW, NEVER REMOVED FROM BOX. THIS LISTING HAS A TOTAL OF 15 PACKAGES OF WHITE COLOR C-6 SIZE BULBS AND THEY ARE PRICED PER PACKAGE. A FEW HAVE COLOR RUBS BUT MOST APPEAR NEW/NEVER REMOVED FROM BOX. THIS LISTING HAS C-6 SIZE BULBS IN ORIGINAL PACKAGES AND THEY ARE PRICED PER PACKAGE. SOME OF THE BULBS HAVE COLOR RUBS BUT MOST ARE PERFECT. I HAVE NOT TESTED ANY OF THESE BULBS OR ANY OF THE OTHER C-6 BULB LISTINGS BUT I WILL CHECK THEM PRIOR TO SHIPPING TO YOU. I’VE GROUPED THESE C-6 SIZE BULBS INTO ONE LISTING. THERE ARE 5 OBVIOUSLY NEVER USED ORANGE COLOR, THERE ARE 8 ASSORTED COLORS (ORANGE, YELLOW, WHITE) IN A PACKAGE, AND THE OLDER BOX HAS 2 RED BULBS AND 8 YELLOW (A FEW HAVE COLOR RUBS/PAINT LOSS). 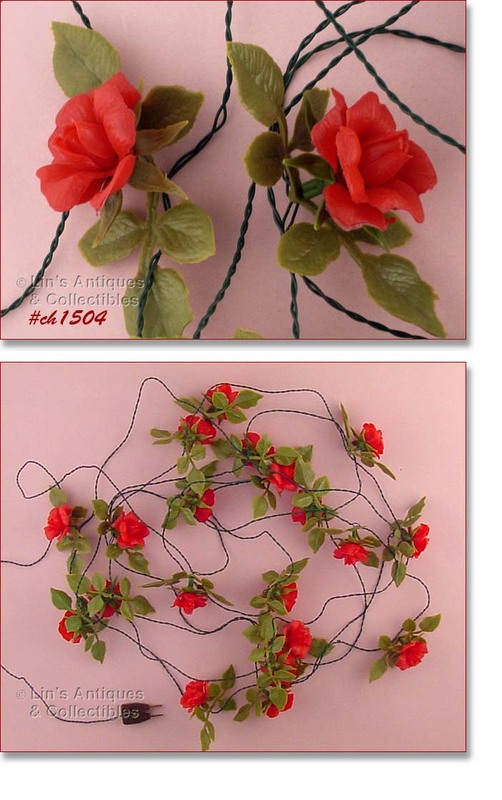 THIS LISTING HAS A SET OF GLO LITE BUBBLE LIGHTS WITH THE ORIGINAL BOX! THERE ARE 9 LIGHTS, ALL LIGHT UP AND ALL BUBBLE. THEY HAVE THE GLASS SLUGS WHICH DATES THEM PRIOR TO 1950. VERY NICE LIGHTS! AS WITH ALL OLDER ELECTRICAL ITEMS, PLEASE USE WITH CAUTION.